The Apple iPhone is a very expensive gadget to own, and so stands to reason, then, that repairs would also cost more than your average device. The value of having a warranty system in place in the event of a problem can never be underestimated, and with the iPhone benefiting from the one-year manufacturer’s cover, those who’ve recently purchased an iPhone can, in the circumstance of hardware / software failure, head over to Apple for a repair. If you’re unsure as to whether your iPhone has any kind of warranty with Apple, and would like to find out either because your device is broken, or just for peace of mind, then a little-known automated service on the official Apple site will help you do so. Step 2: You’ll be met with a dialog box which requires you to type in your device’s serial number. Now, depending on what piece of hardware you own, it could be anywhere, but as a rule of thumb, it’s usually found somewhere on the back. For example, on the MacBook Air, it’s underneath your machine just above the FCC logo. If you’re still struggling, there’s a link just underneath the box offering help on how you can locate it. Step 3: Once you’ve typed in the alphanumeric code, one of two things will happen. If your purchase date cannot be validated, you will need to type in the date you bought your Apple device from the store. If the date is not provided accurately, you will need to go through the system, as prompted, to submit your proof of purchase. If your purchase has been validated, you will be provided with all kinds of useful information, including whether your Telephone Technical Support and Repairs and Service Coverage are active, and when they are going to expire, or have expired. 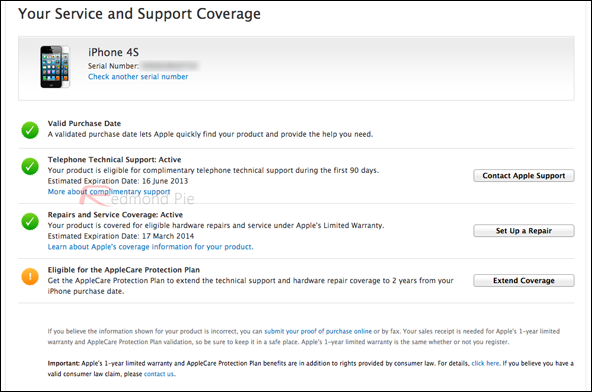 You will also be notified as to whether you can extend your warranty through the AppleCare program. So, there you have it. Some of you will probably have already been aware of this process, but for those who weren’t, you can now make any necessary provisions to ensure you are adequately protected. what if the iphone is yet to activate? will the warranty activate from the day of the activation of the iPhone?